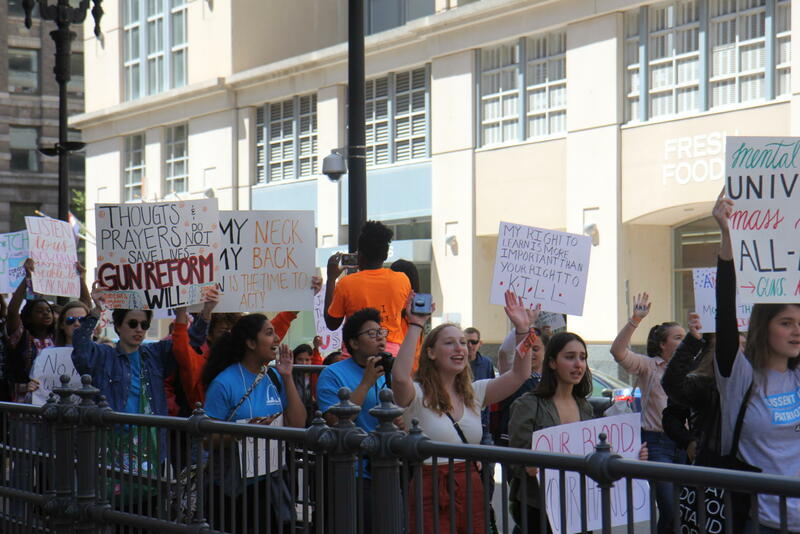 Students hold a rally outside Missouri Attorney General Josh Hawley’s office to protest his affiliation with the National Rifle Association (NRA) and the lack of legislation regarding the purchasing and usage of firearms. When Tali Gorodetsky, junior, was at a religious convention the week of Feb. 14 her friend got a call from his parents, telling him that his cousin, Jamie Guttenberg, had been killed in the shooting at Marjory Stoneman Douglas High School in Parkland, Fl. Gorodetsky said Students Demand Action St. Louis (SDASTL) was formed by students just weeks later to help continue conversations about gun control and legislation after the Parkland shooting. Last Friday, SDASTL held a rally outside Missouri Attorney General Josh Hawley’s office to protest his affiliation with the National Rifle Association (NRA) and the lack of legislation regarding the purchasing and usage of firearms. Gorodetsky said SDASTL had been organizing the rally and spreading the word since early February to help perpetuate the message of the March for Our Lives in March, coined by survivors of the school shooting in Parkland. SDASTL included 22 schools, including two colleges: St. Louis University and Washington University in St. Louis. So, she helped plan the rally, and outreach began. The group has mainly advertised the movement through social media, Gorodetsky said, to help steer the idea to students. During the first-hour walkout at Marquette, another school shooting occurred at Forest Hills High School in Florida. There was one injury, and the suspect was taken into custody. So, a mix of students from all over the St. Louis area who wished to support the victims of the Parkland shooting and advocate for gun control showed up at Hawley’s office in downtown St. Louis, including Sophia Hultberg, sophomore. Hultberg mentioned that she felt that while Superintendent Dr. Knost’s take on the protest and walkout wasn’t favourable, she appreciated Dr. Mathison’s understanding of the students who chose to participate. Community members also attended the protest at Hawley’s office on Friday afternoon. Becky Morgan, a member of Moms Demand Action (MDA), has been involved in advocacy for gun control since the shooting at Sandy Hook Elementary School. Morgan said that coming together as a community was truly important when dealing with issues like these, and came to the protest to show her and her group’s support for the student protesters. Morgan mentioned that she was far from surprised at the turnout at the rally, which included more than 40 schools. Izzy Essman, senior at MICDS, said she joined SDASTL and their efforts to plan the rally very casually. Because Essman is a part of a private school, she said getting students together who were able to walk out and take time out of their school day was difficult, so she came to help speak for those who couldn’t attend. Essman also mentioned that the administration’s approach to handling the walkout and a few students coming to the rally was understandable. Essman said that, overall, she feels lucky to be able to show up and stand up for her beliefs, and that there is a platform for other St. Louis area students to do the same. Another community member, Abram McGull, had been buying Diet Cokes for him and his wife when he saw the crowd of students around Hawley’s office. Intrigued, he came over for a look at the commotion. McGull said that when he came over to look at the protest occurring, he didn’t expect to come across this many people. “I saw on the news that protests were taking place across the country, and I’m so proud to see so many Missouri students here protesting and showing up as a mass force to show their feelings about gun regulation,” McGull said. McGull also mentioned that he believed that peaceful protest, and support from community members for the students, was a key part of creating change. Evan Del Carmen, senior, attended the march because of his beliefs opposing the NRA. “The NRA is a terrorist organization that funds the slaughter of children, and I will not stand for that, and neither should our politicians,” Del Carmen said. Del Carmen said it’s important for students to get involved in activism because the 18 to 34 age range is the most underrepresented age range in politics. If the large population of this age group uses their power politicians will be forced to listen to their constituents rather than following the money. Del Carmen said while the turnout at the rally is something, it is not nearly what it should be. “Our generation is seen as being weak and refusing to take action, instead of being seen as that maybe we should be the generation that even more than embracing change drives change,” Del Carmen said. Del Carmen said his message to the MHS students who didn’t participate in the walkout or rally is that they have to put their money where their mouth is. If they say they are against the proliferation of guns in America, Del Carmen expects to see them protesting regardless of whether they have testing that day or not. Del Carmen said he wants students to stand up for their beliefs – even if they differ from his own. “If you are against more gun regulation and you are not here I understand that, and I identify with that more than you saying you are for gun regulation and not showing up,” Del Carmen said. Susie Saxon, junior, said showing up is especially important as a student at MHS, a predominantly white, wealthy school in west county because they have more power given to them by default in comparison to those who have been fighting gun violence in the past. She said students should use their privilege to help enact positive change since they have the opportunity. Two counter-demonstrators were vocal about their opinions were on the rally. One man made his way through the crowd and yelled in the faces of rally organizers whilst flipping them off with both hands. He was removed by police while organizers told demonstrators to, “remain respectful.” Another man yelled, “No one died at Sandy Hook!” from the opposite side of Olive Street. Serena Freese asked police if she was allowed to counter protest. Freese said she is a legal gun owner who knows her constitutional rights, and that she was frustrated by the younger generation’s lack of understanding. Freese said most people who own assault rifles are legal gun owners who use their guns for fun and target practice, and that only a minority of legal gun owners become criminals. Freese said demonstrators should be protesting the laws themselves. She said there need to be stricter punishments for criminals who commit mass murders.